Although community college faculty typically teach five courses per term and are expected to engage in a significant amount of committee work, many of us still find the time to engage in research. That research can result in college-wide, national, or even international presentations or articles in publications like Practicing Anthropology or American Anthropologist, as well as those for more specific publications like Culture, Agriculture, Food & Environment or the Journal of Latin American and Caribbean Anthropology, or even a full-length manuscript or textbook. A few years ago, the first peer-reviewed open access cultural anthropology textbook was produced by the Society for Anthropology in Community Colleges. That textbook called Perspectives: An Open Invitation to Cultural Anthropology was edited by Nina Brown, Thomas Mcilwraith, and Laura Tubelle de Gonzalez. As an open-access textbook, it is available for free. This effort along with recent work on a new open access text called Explorations: An Open Invitation to Biological Anthropology demonstrate how well community college faculty juxtapose teaching with research and writing. For me, writing a book has been an enriching process. My interest in the environment combined with a social science skill set led me to write Wild Capital: Nature’s Economic and Ecological Wealth (forthcoming). The book considers how by failing to assign nature value, the opportunity costs of diminishing biodiversity or destroying habitats have not been recognized in the marketplace. That failure has led to significant negative consequences for both nature and us. I use the lens of the social sciences, specifically anthropology and economics, to demonstrate how by recognizing nature’s total wealth we can make better decisions regarding development and conservation. An interesting side effect of this research effort, though, is how it has made my teaching fresher and more relevant to my students. 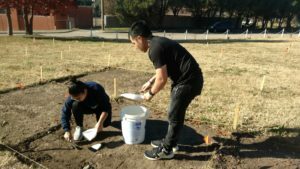 Although not all anthropology students want to hear about natural resources and capital assets, they do have a tremendous interest in anthropology’s field methods. After spending a significant amount of my free time in the field (from sites around the United States, as well as those in Asia), I was able to bring both the excitement and the challenges of these more recent field experiences into the classroom. Keri Sansevere of Brookdale Community College recently finished her PhD and is now working to get her dissertation published. 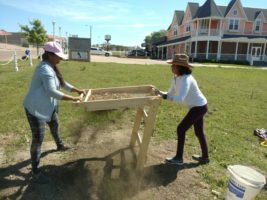 Her archaeological research focused on a type of low-fired coarse earthenware called colonoware that is typically found in Chesapeake, American Southeast, and Caribbean plantation sites. She searched for evidence of this pottery in the Northeast United States in her dissertation, titled “‘Anything but White’: Excavating the Story of Northeastern Colonoware.” Sansevere uncovered 25 assemblages by excavating the memories of colleagues and digging through obscure literature. The lives of northern bondsmen have been largely concealed in the historical record, yet these individuals were clearly a very visible part of northern society and Sansevere’s research on northern colonoware helps tell their stories. Sansevere also demonstrated how artifacts of the past, like colonoware, can shed light onto the present. Anecdotal information written in technical reports combined with Sansevere’s experience accessing collections and navigating structures of power within the discipline reveal the present day mechanisms and politics that shape how knowledge of the past is produced, how access to heritage is controlled, and how bias is created in object-based research. Her expertise in both historical archaeology in general and colonoware specifically has made her a real asset to Brookdale’s students. Beverly Bennett of Wright College in Chicago is currently engaged in sabbatical research that compares approaches to representing Native North American cultures in different types of museums from large institutions to local tribal museums. Issues she is considering include themes and modes of interpretation, audience responses, and changes in these matters over time. The goals of her work are to gain insight into cultural identity, to improve cross-cultural understanding, and to aid both instructors and museums in moving toward these goals. Since 2015, Tim Sullivan, the lead faculty anthropologist at Richland College in the Dallas County Community College District, and his colleague Clive Siegle, a history professor, have been working on the Little Egypt Project. Little Egypt was a community founded by former slaves in 1883. This community persisted until 1962, when the occupants sold the land to a real estate development company. After receiving $6,500 each, the families then moved and resettled to areas around Dallas County. Despite the growing middle-class suburbs that had expanded north and surrounded the little hamlet, up to the time of removal, Little Egypt had remained a rural community, with no paved roads, running water, or sewage, and one shared electric and phone line. Within days of their removal, though, Little Egypt had ceased to exist, and was quickly forgotten. In addition, they now have GIS mapping data, combined with historic aerial photos and some recent drone views to map the site where they are working. The inclusion of this technology has proved attractive to the Computer Games Department and those students now help with the virtual 3-D reconstruction of a site homestead, along with other structures that include a smoke house and possibly the church. This project has captured public attention in local newspapers, the television news, and a local NPR radio station (KERA) news. Research efforts like these show just how critical they can be for not only us as professional anthropologists, but for our students, as well. Many thanks to Keri Sansevere, Beverly Bennett, and Tim Sullivan for their contributions to this article!